Shaping a Sustainable Future, a partnership of academia, industry and society. 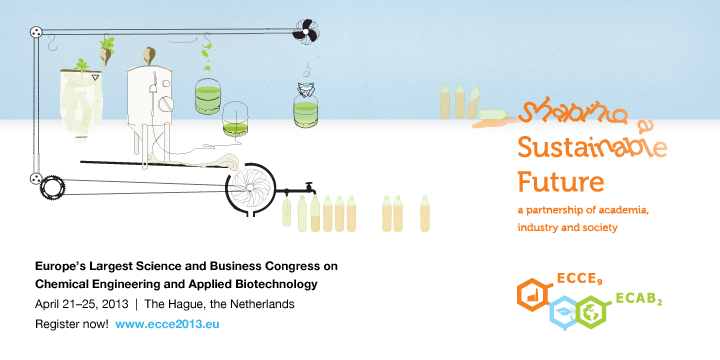 The 9th European Congress of Chemical Engineering (ECCE9) and the 2nd European Congress of Applied Biotechnology (ECAB2). The European congress ‘Shaping a Sustainable Future’ brings companies, international researchers, European politicians, policy makers, promising students and innovative start-ups together to jump-start forward-thinking efforts to improve the speed and efficiency of innovation processes. A special innovation track tailored to your specific interests complements the scientific programme, bringing you in contact with new clients, business partners and the latest innovations from SMEs and promising start ups. Check our website www.ecce2013.eu to see the inspiring programme and the names of our renowned keynote speakers and to find out all about the Holland Pavilion and the Exhibition and Networking Fair. The innovative strength in the process industry offers enormous opportunities to achieve a sustainable society. Collaboration between the corporate world, government and science plays an essential role in realising that objective.